Arriving at Firle Beacon, exposed to the full westerly current as it travelled across the landscape to meet the land mass, this was Ridler at his most free. Away from the cell’s dimensions of the caravan, the narrow minds of the village, the puritan judges of a world stiff with conformity, he was alive. The ochre sun, now drowned in the horizon, coloured the very top of the spiralling clouds above him. He discarded his jacket and shirt and - bare-chested, arms spread wide, head thrown back – felt the strong, warm breeze on his stigmatised skin. 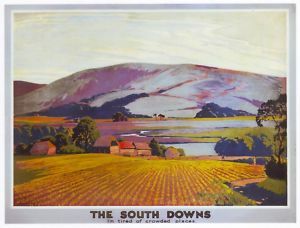 Below him, the panoramic vista he had grown to rely upon: the wheat-packed fields mapping away from him to the cloud-mirrored ridge of the Weald; the county town of Lewes, cradled in the creases of the surrounding hills; the tied villages, standing firmly at the centre of their feudal estates; and the Tower, that single turret of sturdy split flint that so mocked his own Englishman’s castle. The solid and unchanging landscape of tradition, of England. Ridler, himself born so English, had made himself so foreign; and now he felt connected to this pastoral idyll, this England, but not to its people. He inhaled deep and long through his nose and exhaled loudly and capaciously from his mouth until his breath became first a bellow and then a roar. A roar of affirmation, a roar of freedom, a roar of innocence: he could not be blamed for the way the Writer’s brief stay had ended. Way down in the village of Firle, had anyone looking up been able to see or hear clearly, they would have made out a variegated bestial figurehead on the bow of the Beacon, sailing away in the fading light, proclaiming the clarity of his conscience. Replacing his jacket and shirt, Ridler draped a scarf over the top of his head and held it in place with a battered, broad-brimmed felt hat he had taken, with the scarf, from his jacket pocket. Tying the scarf under his chin, in such a way that only eyes, nose and mouth were visible, he began the climb down to Firle picking his way carefully down the gradient. He could see the car lights on the Lewes Road, fuller now but still a dull, lazy amber, and a cloud of steam as a train was leaving Glynde station. These – the road and the rail - demarked the two lines he would need to re-cross before he could feel less threatened. When he would be walking in the cool and quiet of the tree-lined lanes that led him home, he would be happy. As he descended, the stiff breeze of the Downs subsided and the flat land rose to meet him.